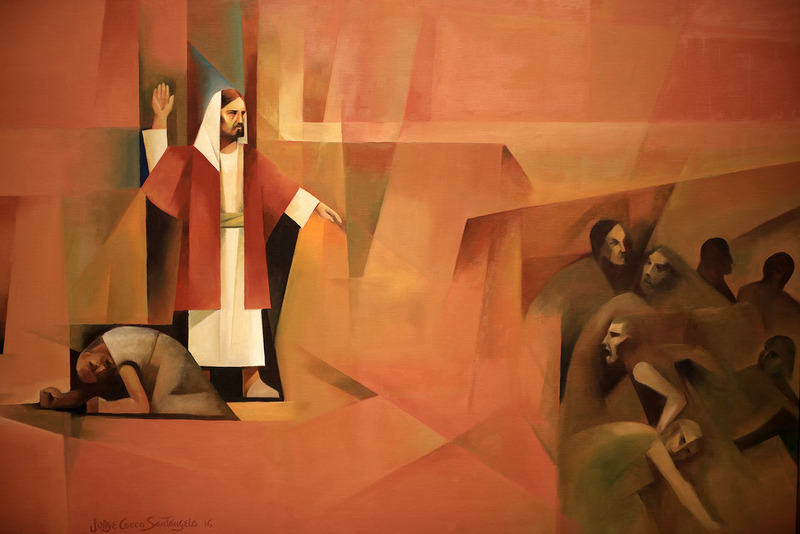 At first it may seem like a strange combination, painting scenes from Jesus’s life in a more modern cubism style, but noted LDS Argentine artist Jorge Cocco Santángelo, said that is how he found his voice and a way to deliver a more powerful spiritual impact. 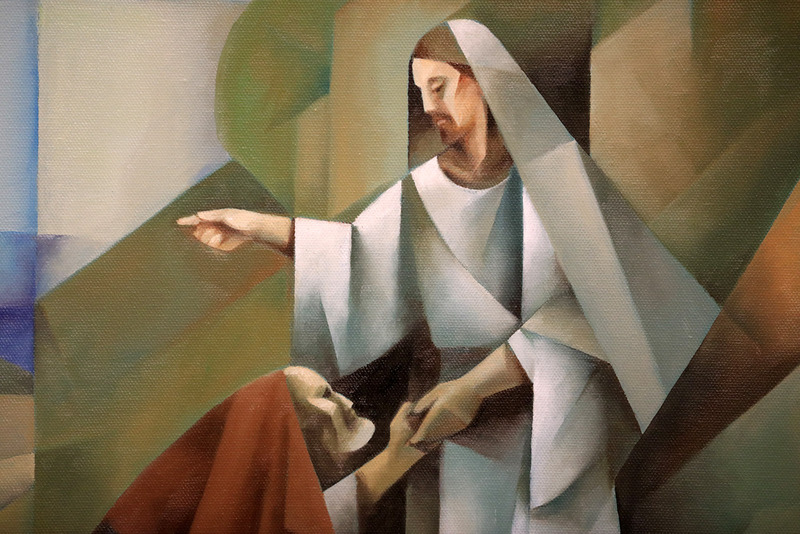 A new exhibit of twenty-four of his paintings, called “Sacred Events from the Life of Christ” has just opened at the Church History museum in Salt Lake City, and he was there Thursday to talk about them. The exhibit will run from May 17 to Oct.1, 2018. 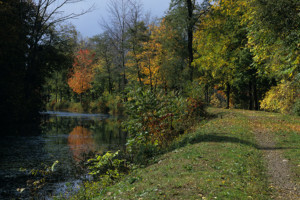 A sampling of some of his paintings are in this photo essay. 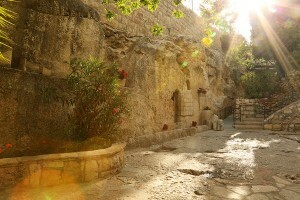 Please click on this link to see a fuller collection from the Church History Museum. 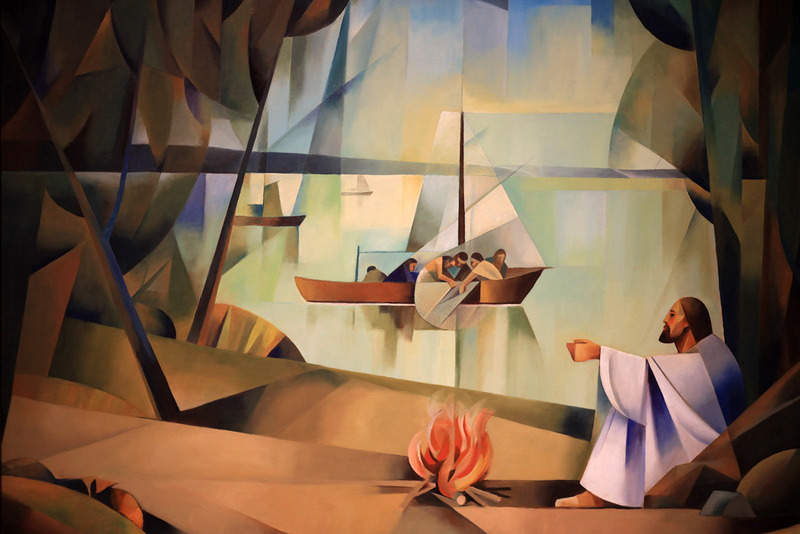 He had painted spiritual topics in a more traditional style for years, when he discovered that for him with modern art he could go deeper into the essential teachings of the gospel. 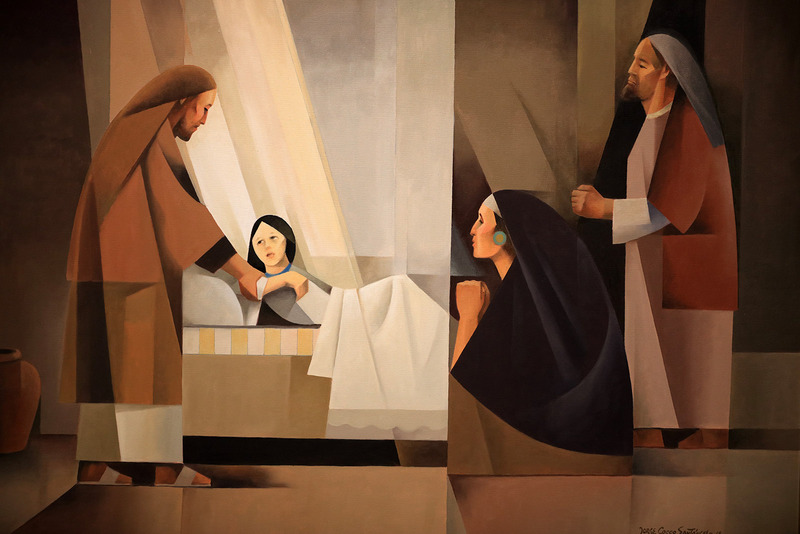 At one point in his life he explored all the artistic movements of modern times, but what he calls the sacrocubism style that he developed gave him a painting method that paralleled the event from the Savior’s life. With this style he could strip away all of the superfluous details of clothing, landscape, anatomy and geography and just concentrate on creating a microcosm where the colors and lines carried the message. “Colors and lines have an expressive language,” he said. 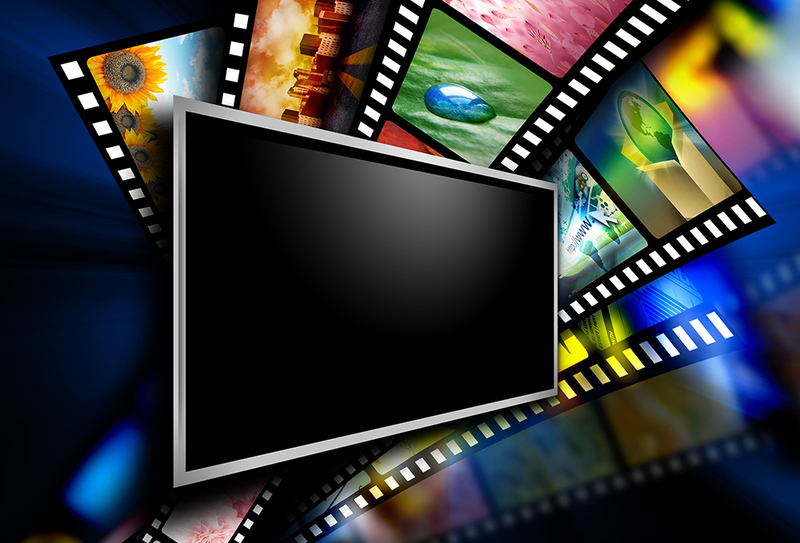 “Horizontal lines are calm and vertical lines are spiritual. 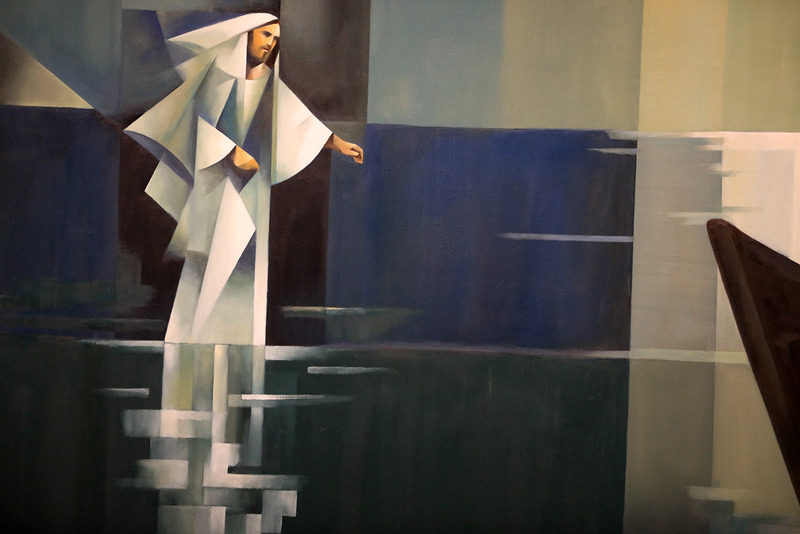 When they interact with warm and cool colors, they make something tranquil, like music.” In a painting like “The Tempest—Peace be Still”, for instance, Cocco is using the picture to create a metaphor that Christ it the master, the Lord of everything. 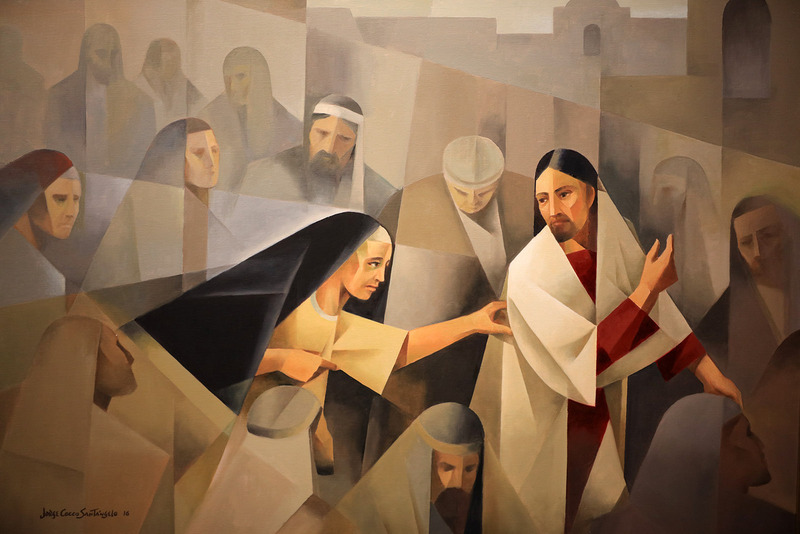 Laura Allred Hurtado, Global Acquisitions Curator for the Church History Museum, said that Cocco’s style was narrative enough that people could have access to it, yet at the same time had all the influences of modernism which was a different approach to renderings of the Savior. 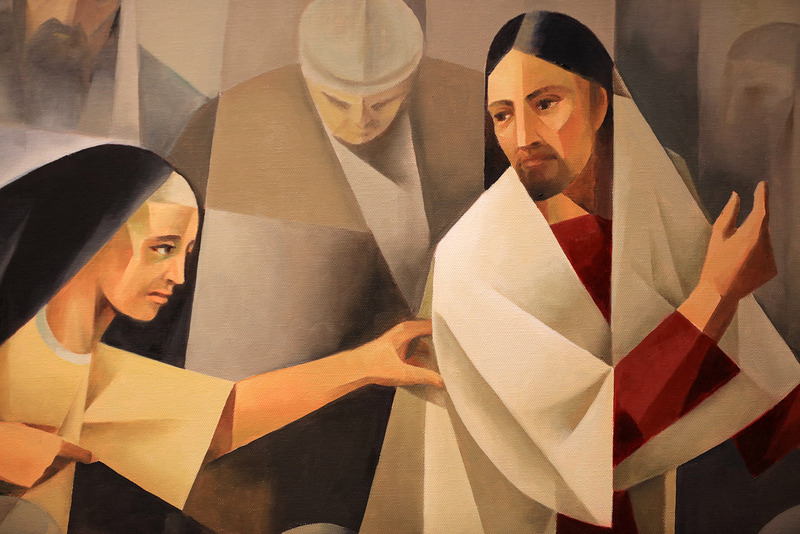 “One of the things interesting to us,” she said, ”is by the artist sweeping away the details of hair and clothing, the painting gets you right to the essence of the story and then the scripture can yield more and more information to you. 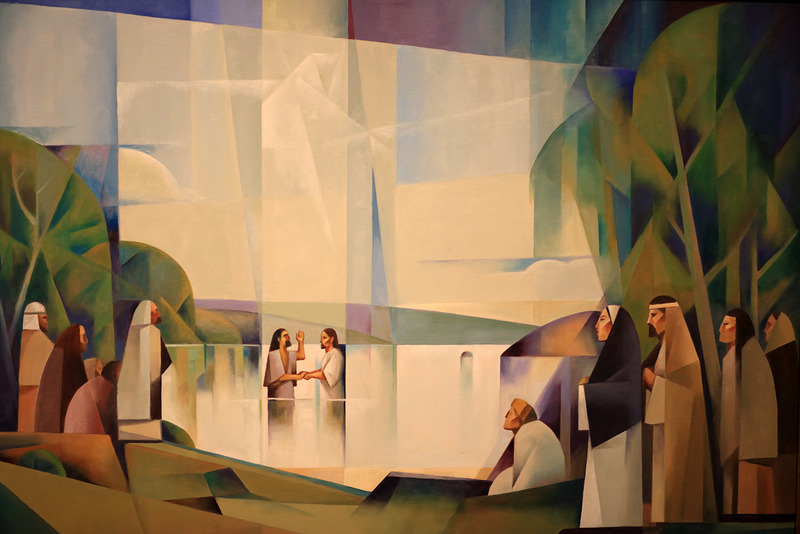 “Part of Cocco’s painting process,” she notes, “is to read scriptures before he starts to paint.” It has become a written-down and approved policy of the Church History Museum to collect in depth an LDS non-USA artist each year, thus adding sophistication and breadth to our understanding of how to paint things of the Spirit. 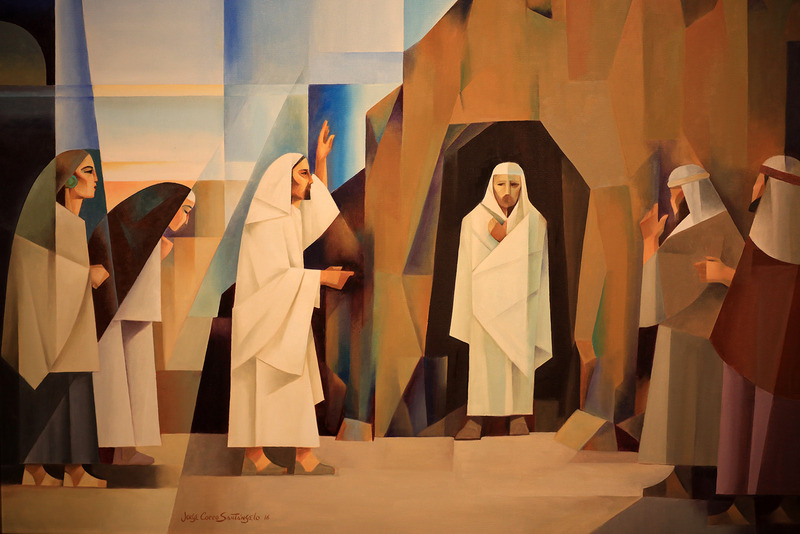 Three earlier paintings from Cocco are included in the exhibit to demonstrate the evolution of his style. 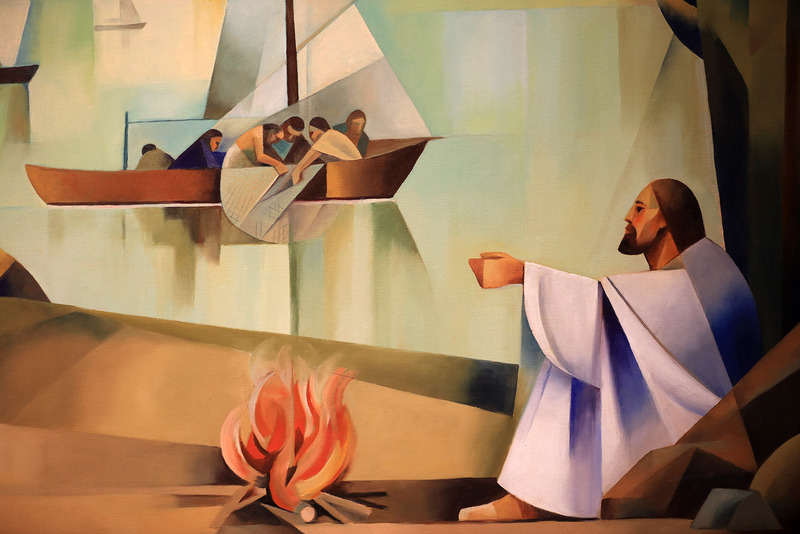 Cocco was born in 1936 in Concepción del Uruguay Entre Rios, and, of course was raised Catholic, but, he says he found himself with an uncertainty about the meaning of life and a hunger to find meaning. He searched diligently through various churches but did not find the satisfaction for the soul-yearning that seemed to plague him. When he was married, he was looking forward to what life would hold, but still felt this spiritual hole. However, the church was growing along the other coastlines of the river, which was part of the Uruguay mission. Then one day two missionaries crossed to the other side of the river to see what they could find in Argentina, with no success. They might have given up, but one of the missionaries said that he just knew someone was waiting for them. 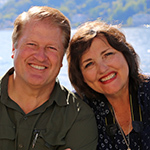 When they came back on the boat, they happened to sit by Cocco’s wife’s cousin, and eagerly they asked what she knew about the Mormon Church. She wasn’t interested, but she said, “My cousin is always searching for something like that.” The missionaries took Cocco’s address. 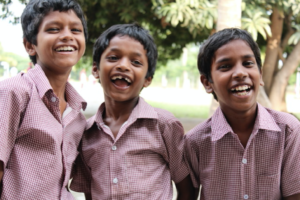 If ever there were a set of missionaries blessed with two dream questions, these were they. 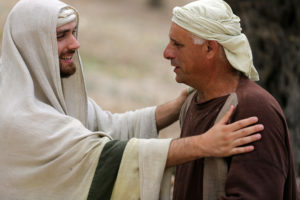 “When they gave me a Book of Mormon,” Cocco said, “This is it! 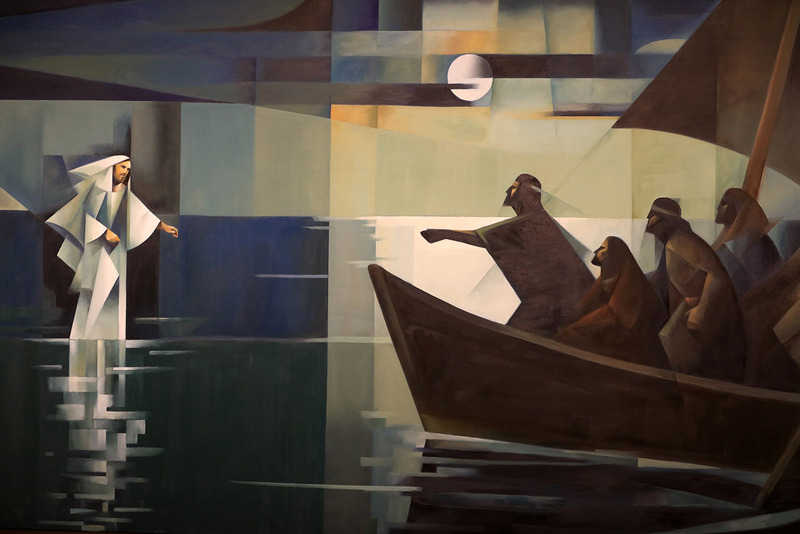 Let’s go to the river.” They took two boats in the middle of winter, went around an island, and Cocco and his wife, pregnant with their first baby, were baptized. 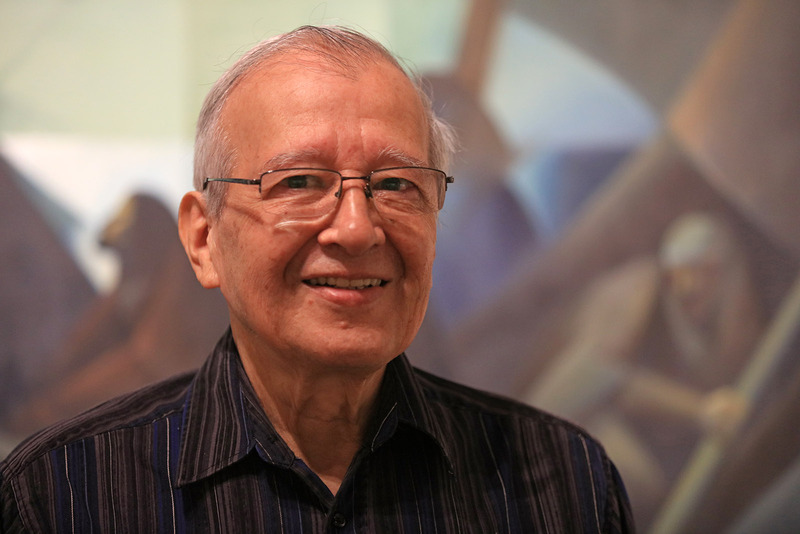 To advance Cocco’s art career, the family moved in 1965 to Buenos Aires, and then in 1976 to Spain, so he could have access to more opportunities. 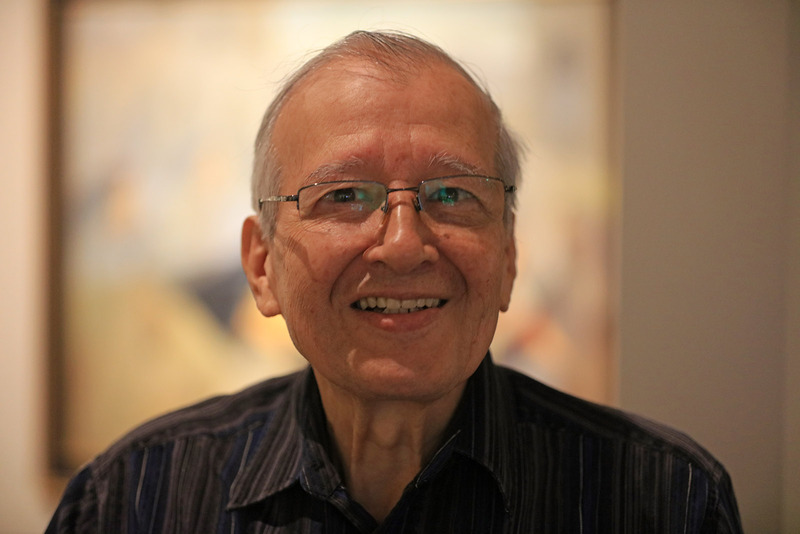 He taught drawing, painting, etching, and art history at the Universidad de las Americas in Mexico City for many years. 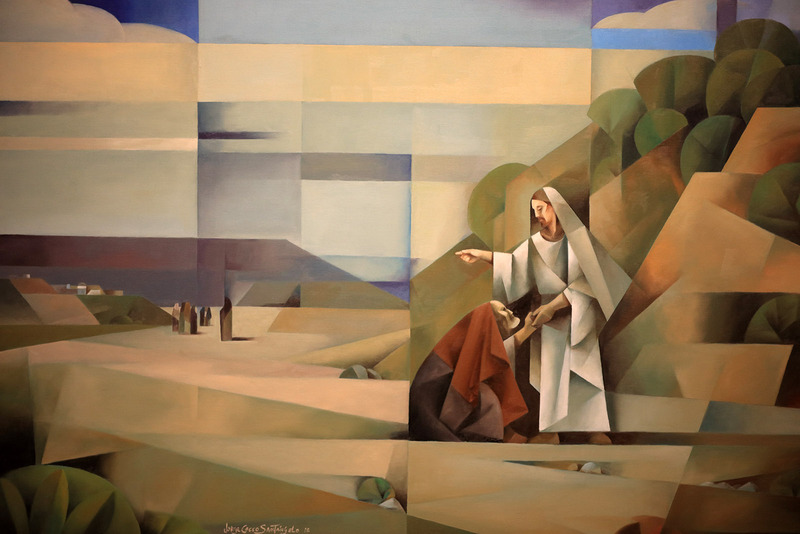 Again, a new exhibit of twenty-four of his paintings, called “Sacred Events from the Life of Christ” has just opened at the Church History Museum in Salt Lake City. The exhibit will run from May 17 to Oct.1, 2018. I had the pleasure of meeting this brother and his son at BYU education week. 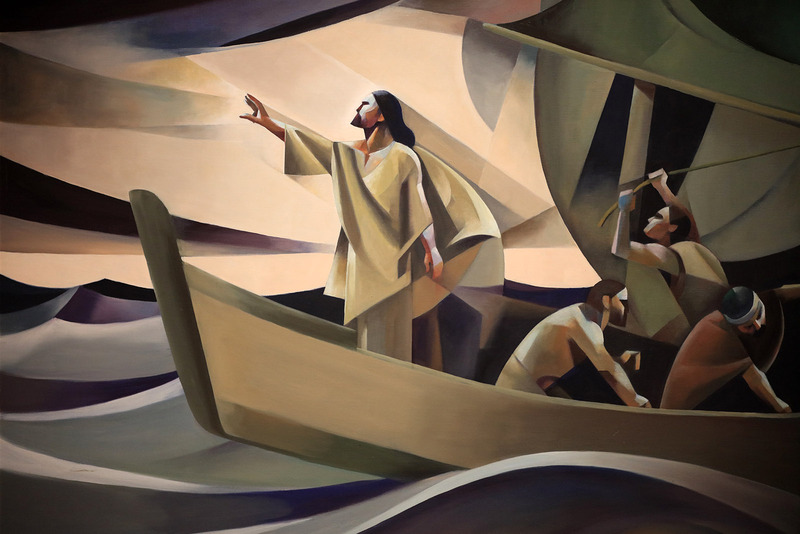 The use of light and dark, and his style make for stunning art that is so different from the "traditional" styles. 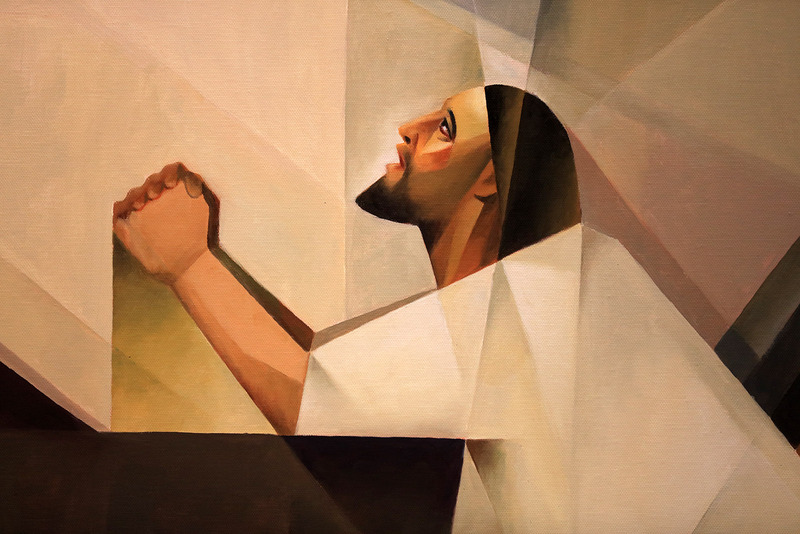 They draw your eye, and heart, to Jesus in every painting! I purchased four of his prints and look forward to getting more.